Keto Macro Calculator Review | Which is the best? Today we are reviewing the top macro calculators to help you determine which is the best one for you. Many people don’t have access to a DEXA scan or an inbody to calculate their BMR and subsequently their TEE. That’s why we’re here to help you weed through the many different keto macro calculators to find the right one for you. The term “macro” is short or slang for macronutrients. Macronutrients are carbohydrates, fats, and proteins. Carbohydrates (carbs) and protein contain 4 calories (kcals) per gram and fat contains 9kcals per gram. Some people in the keto realm consider ketones as a macronutrient because they contain 7.2kcals/g. What is a Keto Macro Calculator? A keto macro calculator is a calculator that helps you estimate how many calories per day your body needs to either gain weight, lose weight or maintain weight. Macro calculators take into account a person’s height, weight, age, activity factors (exercise regimen + energy expenditures at work), and weight goals. Once you the macro calculator gives you your BMR (basal metabolic rate) and TEE (total energy expenditure) they typically have you type in your goals (weight loss, weight gain, weight maintenance). After this it will break down those calories into specific macronutrient goals. This is where you will get your individual carbohydrate, protein and fat macros. Other terms people use with macros are macro counting, flexible dieting or If It Fits Your Macros (IIFYMs). These all mean about the same thing. Basically you can eat whatever you want as long as at the end of the day you hit those macros. Now I’m not saying you should be eating keto treats or pop tarts (for those non-ketoers) every day. Most of your calories should be coming from micronutrient dense whole foods, and if you have room, fill them with less nutrient dense foods. Why should I track my macros? Tracking your macros allows you to have flexibility in your diet and not be confined to a meal plan. It gives you power to chose which foods you want to eat each day (within reason) and still hit your macros. I’ll be reviewing the top macro calculators on the first page of google and then the top keto macro calculators. For these calculations I will be using my age 31, height 5ft 7in, weight 155#, activity factor light (option 1) or moderate (option 2 if only other option is sedentary), goal maintain weight (recomp if no maintain available). 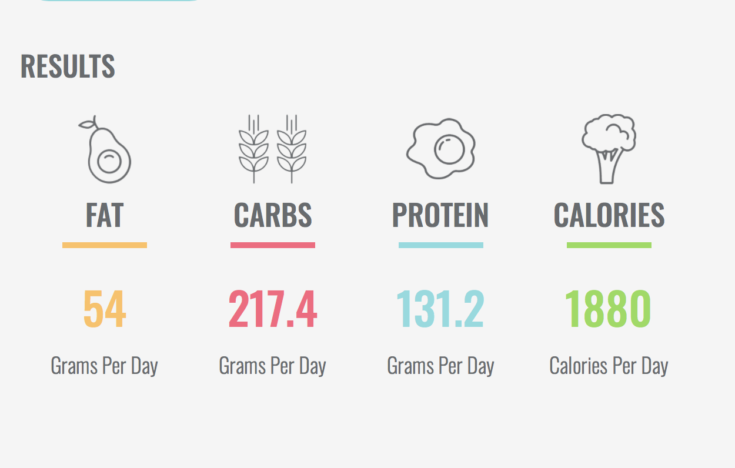 Healthy Eater – 1969kcals per day broken down into 242g carbs, 127g protein, 55g fat. 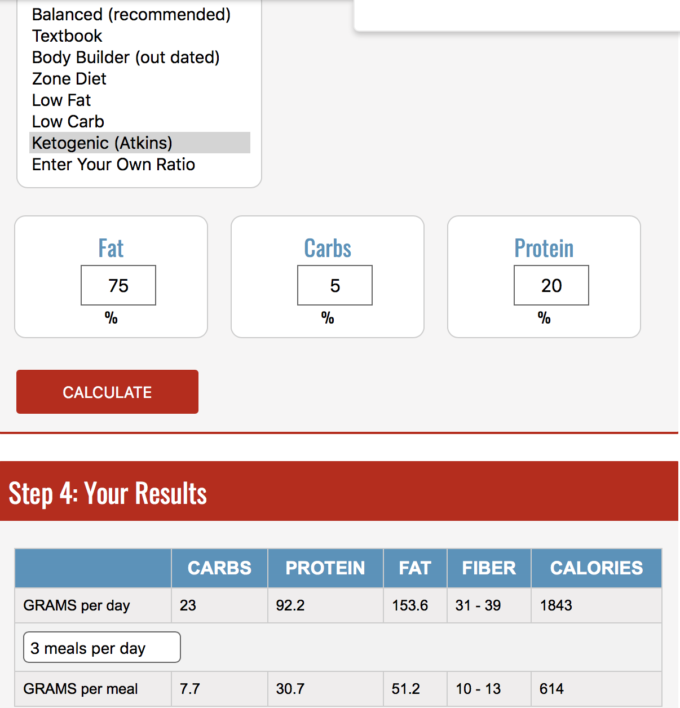 This macro calculator uses protocols of 49.2% carbs, 25.8 protein and 25% fat. Allows you to break down into meals and to increase protein values only. Katy Hearn Fit – 1880kcals per day broken down into 217.4g carbs, 131.2g protein, 54g fat. 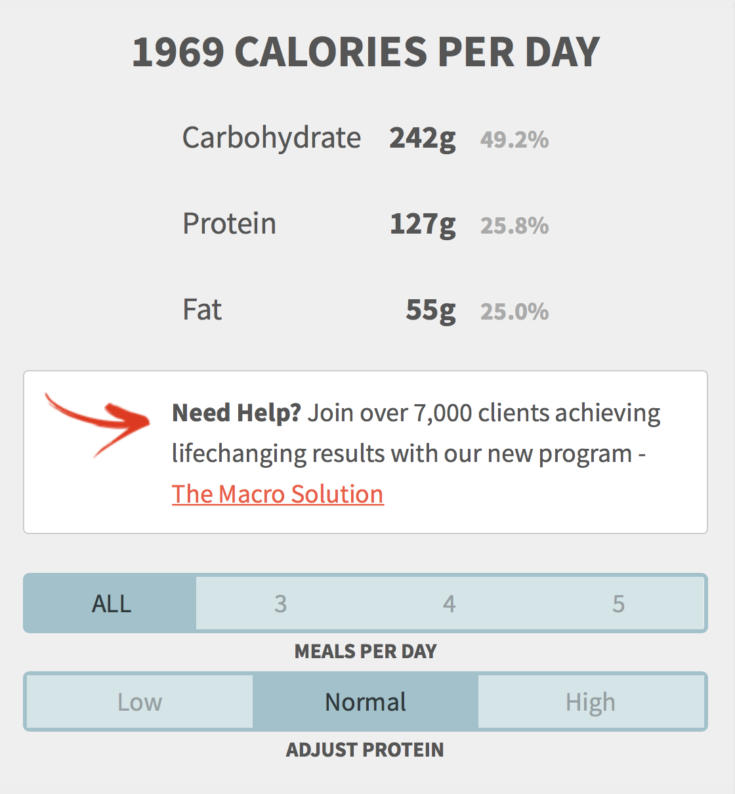 This macro calculator uses protocols of 46.2% carbs, 28% protein and 25.8% fat. No option to change ratios or break down into meals. Meal Prep On Fleek – 1843kcals, 23g carbs, 92.2g protein, 153.6g fat. This one by far was more in-depth. It had spaces to put your body fat percentage, how many minutes per day you workout and how difficult your workouts are. This macro calculator actually lets you change your macros based on which diet you want to try including balanced, textbook, body builder, zone diet, low fat, low carb, ketogenic, or enter your own ratio. I selected the ketogenic ratio and then it allows me to change the percentages for each macro. I chose 75% fat, 20% protein, 5% carbs.It also tells you the carbs per meal and lets you chose how many meals per day you want to have. One error though – it says to have 31-39g of fiber per day when it also says total carbs are 23g. BodyBuilding.com – this one didn’t give your total calories, but you can easily calculate them from the macronutrient breakdown they give you. My macro breakdown was 180g carbs, 120g protein, 44g fat. There was no option to choose different macro ratios. 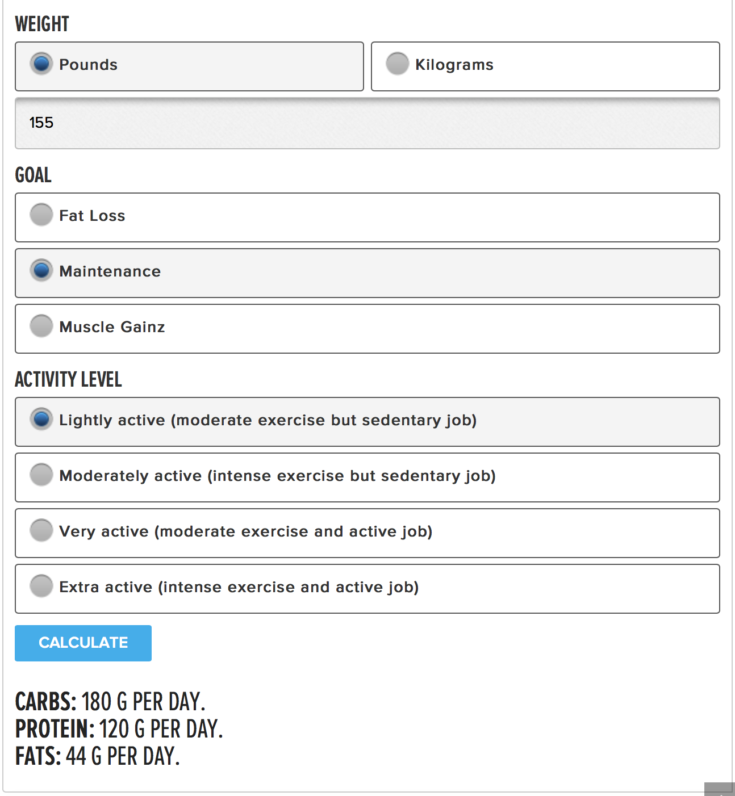 Transparent Labs – At first glance this looks like a super basic macro calculator, but in fact it closely resembles Meal Prep On Fleek’s where you can change the diet, say what, how long and how frequent you workout along with how active your day job is. You can choose from Low Carb/High Protein (50:20:30), Keto (30:5:65), Vegan (40:30:30), The Zone (40:30:30)…..BUT what I don’t like is you have to enter your email to get your results. So I didn’t LOL. 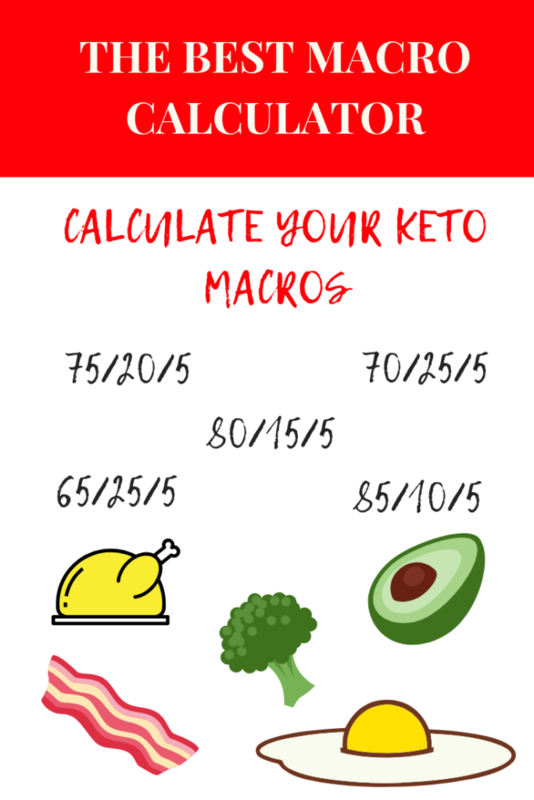 Below are links to other blogs and websites that have their own keto macro calculators. They work the same as the ones above, but are specifically formulated for a keto diet. Ruled Me – I like that they will let you choose how much protein per body weight and how many net carbs you want. They don’t make you enter your email to get your results. Keto Karma -This is a super simple keto calculator. There was only 1 section for activity level. You do not need to enter you email to get your results. KetoConnect – this one is super similar to Ruled Me. It’s super clean and user friendly. They even have a video to show you how to use it. What makes this one different is that it takes into account the thermic effect of food (TEF) – basically how many calories you burn just trying to digest the food you consumed. If you’re old school like me, you can read our blog post about how to calculate your keto macros. I’ll give you a heads up, we use the Mifflin St Jeor equations (through back to grad school yo!). We also have a dedicated keto macros calculator you might want to take a look at.